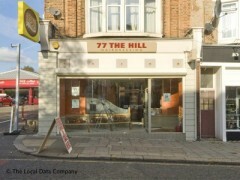 About: 77 The Hill are an award winning hair salon based in Windmill Hill, Enfield. We understand how difficult it can be to put your trust into a hairdresser, it is our pleasure to put you at ease and talk about your requirements. We really care about you and your hair. I came in for curls for a special occasion, my hair was tonged which was pretty standard, especially considering I could have tonged my own hair for free. The curls looked ridiculous as were too tight (I looked like little bow peep), and was told the idea was for the curls to drop. Within an hour my hair was back to being straight and to top it off I was charged £30 for someone to tong my hair!!!! Also, the manager was very abrupt and rude to my mother. I have read many other bad reviews too, just don't set foot in this place. After checking back through our appointments for August, we simply cannot find anyone with your name in our system. Added to this, the price for the service you said you had, is twenty pounds, not thirty and no staff member recalls this particular service. We suspect this review could be fake, however, we are more than happy to discuss this with you if we have misinterpreted anything. Please make yourself known to us by calling the Salon or coming in at a convenient time.